Roofing contractors in our area are required to be licensed to do business. 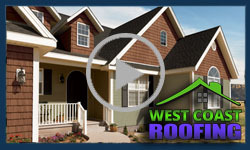 West Coast Roofing is fully qualified and has satisfied all of the requirements for licensure and we are ready to work for you today. We are happy to give you our license information and be sure to check ours, or any contractor license to be sure that you are working with a contractor who is not circumventing the system. To request a copy of our license, call us any time. We are happy to provide our customers with any information they may need to make an informed decision to allow us to work on their home or office.